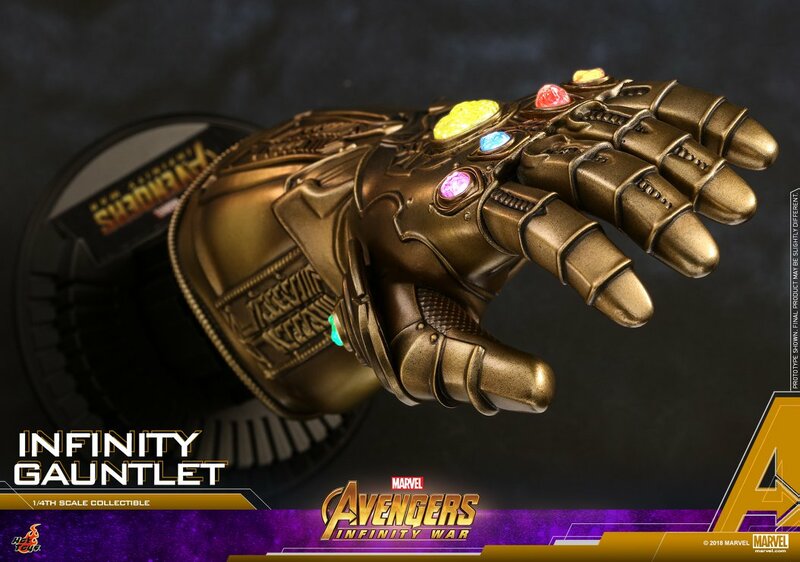 Last month, Hot Toys released photos and details for their upcoming Avengers: Infinity Gauntlet Life Size Replica. At $930, the replica was out of price range for many collectors. 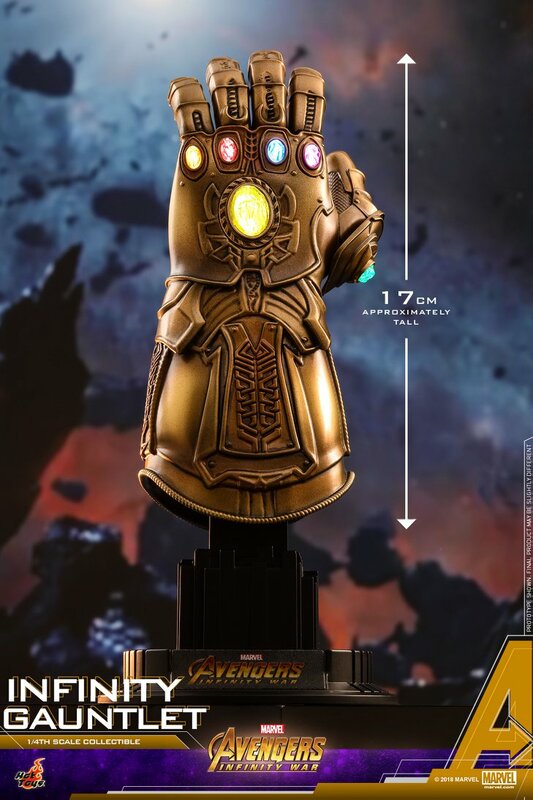 Hot Toys has now announced a smaller version that should be a bit more budget friendly (once the pricing is revealed). 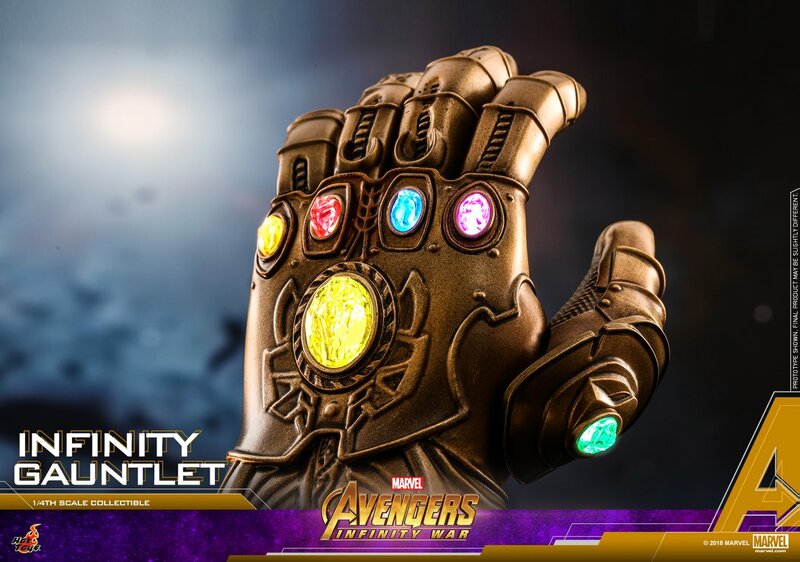 Check out photos and details for their Avengers Infinity War – Infinity Gauntlet 1/4 Scale Replica. Standing just over 6.5″ tall (or nearly 9″ tall on the included base), this small scale replica won’t eat up a lot of space. 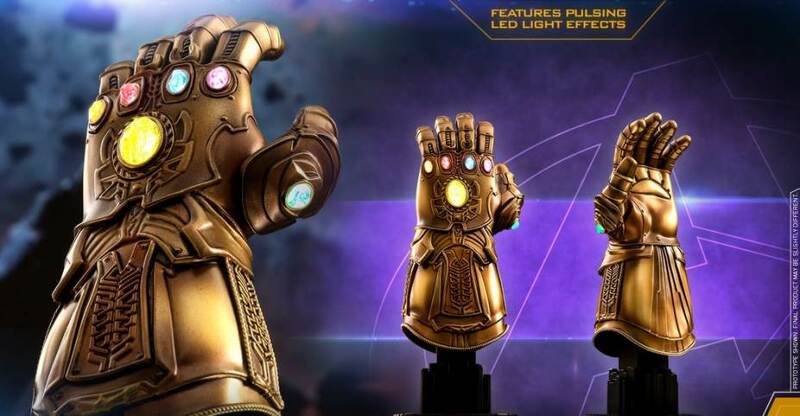 The Infinity Gauntlet also includes light up LED effects for the Infinity Stones. Look for it sometime between the seconf and third quarters of the year. See the photos after the jump. 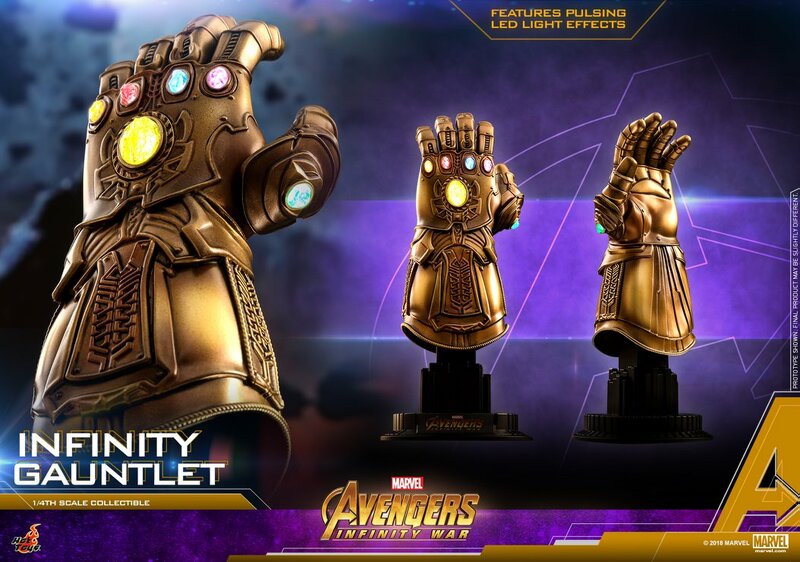 Don’t miss a chance to own this movie faithful Infinity Gauntlet collectible, as it will surely capture the attention among your Marvel Cinematic Universe displays! 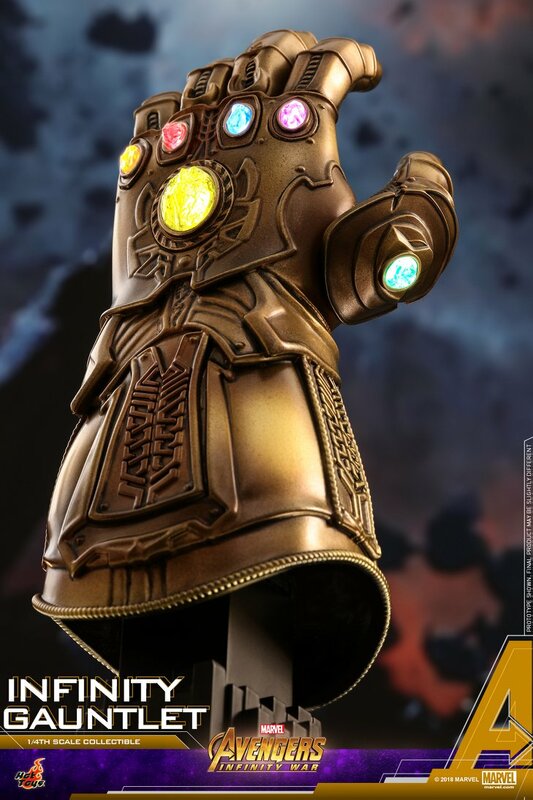 No way I can afford this Infinity Gauntlet. 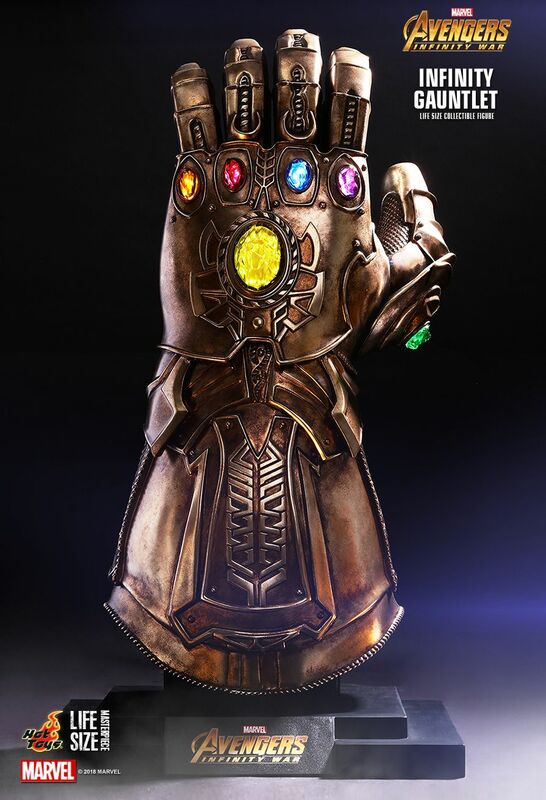 Kinda makes me wanna steal it, Thanos style. Awesome for whomever can afford whatever this will be priced at, great film prop to own. And Hot Toys usually does fantastic pieces so I be this will be great. Looks like I'll be getting a bunch of Hot Toys figures for Infinity War, haven't gotten a Cap or Iron Man yet so I think I'll have to get them from this film. This Thor looks awesome. I may need to get it. And Hot Toys teen Groot? Uh yea I think I'll have to get that as well. 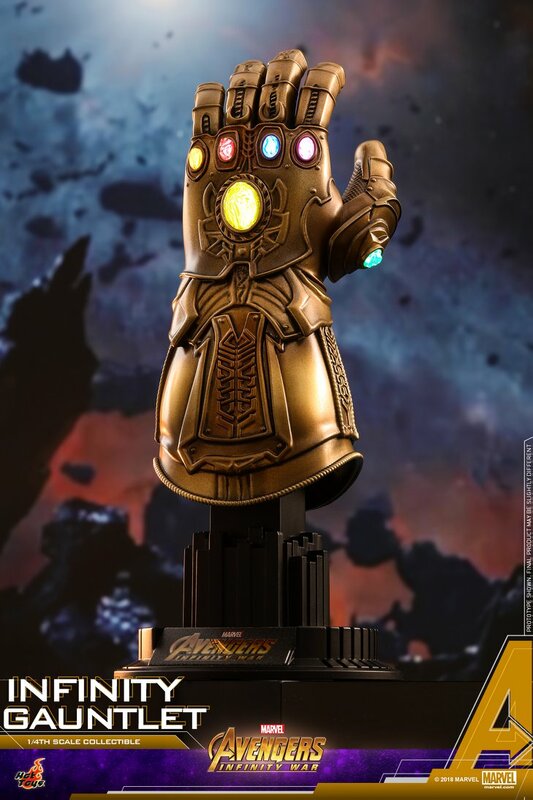 I'm almost scared to ask, but do we have any idea how much that Infinity Gauntlet will retail for? Not yet. If this was "Price Is Right" my guess would be $500. Joe, here is your preemptive "come on down" because I think you nailed it price wise! For the moment, this is the only news outlet calling this the "Mark 50". Has that been confirmed anywhere else? Unless I've missed it, that doesn't appear in Hot Toys announcement. The figuarts version confirmed it as the Mark 50 Armor. That MK 50 is looking sweet! Very sharp and curvy in all the right ways. Looks like Tony learned a lot from his spider-suit developments. Thor's gear seems a little spoilery though. But cool to see he's getting the Ultimates version of the Hammer now. Man I hope not, I was probably gonna get the Hasbro one anyway, but $500 is way out of my league. It looks great but the fun of being able to put the Hasbro one on is a huge bonus. 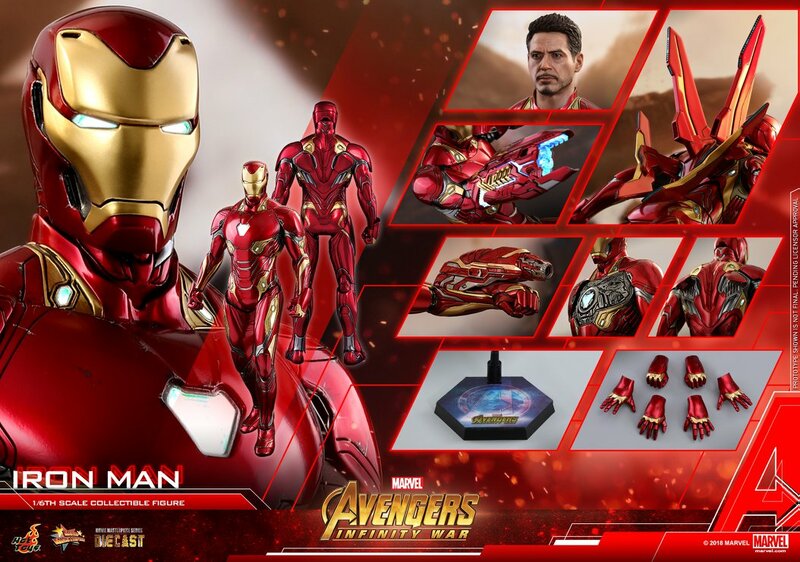 Iron Man MK50 looks really interesting. 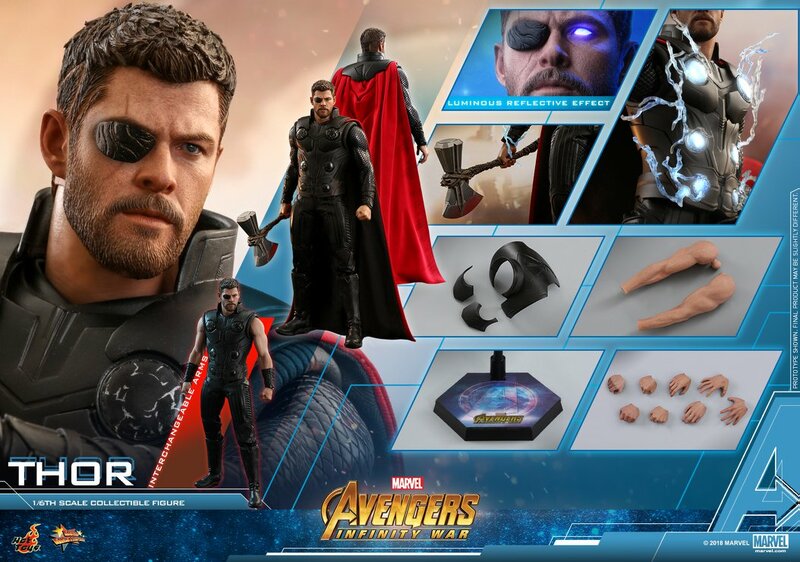 Thor, though -- I just can't get past that eye patch. I don't know why, but thinking of the trailer to Thor: Ragnarok and the fact that they gave him back his right eye in the movie trailer just because reviewers said the patch looked ugly, I clung to this vain hope that by extension they would find some silly way to give him back his eye in Infinity War, but that wasn't meant to be, evidently, and it bums me out, because I think he just looks plain ugly with that black thing on his face. Give him back his eye, and I could go for that figure in a flash. Can't wait to see HT Iron Spider. That Thor though. I wish I could still afford these. 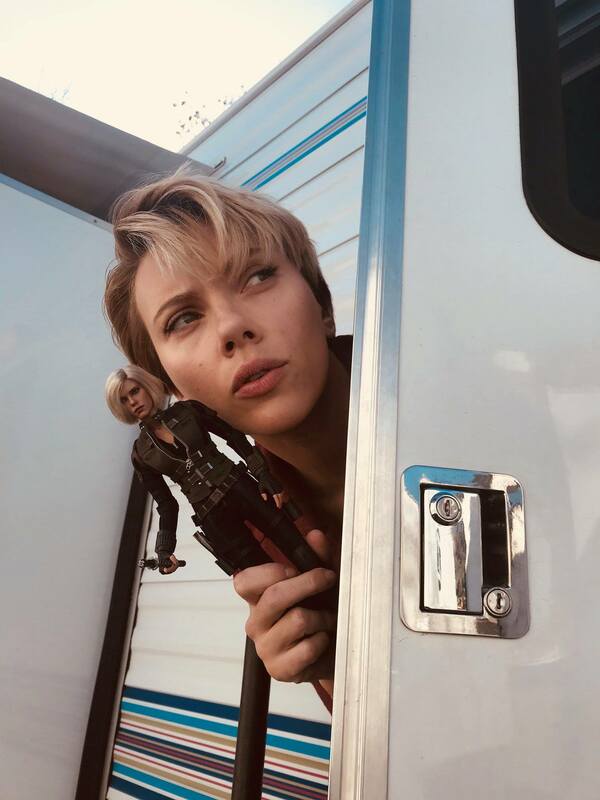 Seems silly that they finally let Scarlet Johansson have her natural blonde hair, yet she couldn�t grow it out. Would have been nice to see her without a wig for a change. 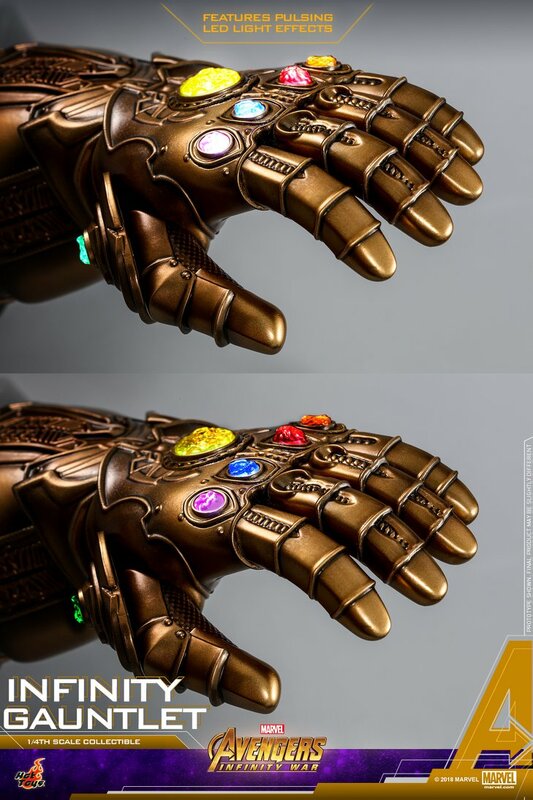 That gauntlet is everything. It's definitely a must have. 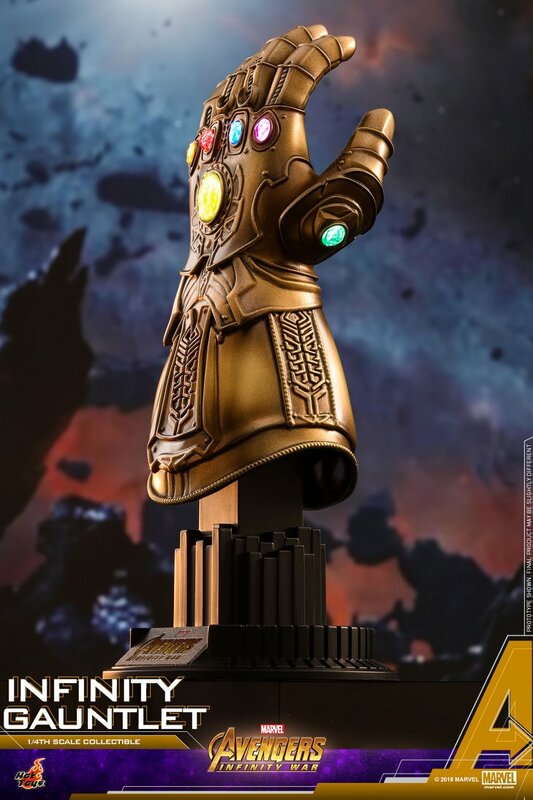 And the Thor figure and Thanos sneak peak are impressive. Very excited for this line. $267 for Thor and $407 for Iron Man. That Iron Man price is ridiculous. Die cast or not. I agree. It looks great, tons of good accessories but I guess I won't be getting this one, way too pricey. If it were $325, I might flex pay it, but $400? I could get 2 Hot Toys figures for that price. LEDs? Swap out arms? That frigging eye effect paint that I'm guessing will not look nearly as good in person as it looks in that photoshopped pic? Wait... do they have the Mind and Soul gems swapped in that? Edit: Guess it doesn't, but color me surpised the Soul Gem isn't the biggest. Hot Toys has a life sized Black Widow figure to model their sixth scale figure? Gauntlet preorder is up at BBTS for $930 with $186 non-refundable down payment. Feels like that’s a real stretch, considering that was basically the going price for HT Hulkbuster, one of the most spectacularly engineered and complex figures of all time.